Some fun to start the festive season here. Last year Hillarys (the blinds people) launched a microsite tool that shows how the cost of Christmas has changed over the years, from as far back as 1968, and the site has now been updated to take into account 2017 prices. 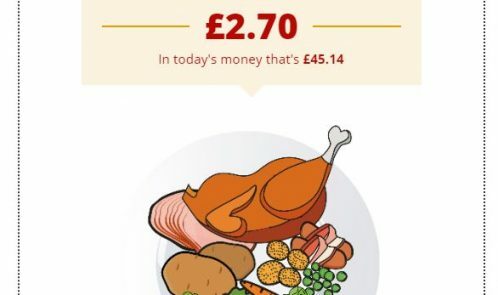 It looks at how much Christmas dinner costs, the best-selling toy of the year, Christmas tree costs and even how much an orange and a piece of coal would have cost you. The team at home interiors specialist, Hillarys (www.hillarys.co.uk), created the online tool in the lead up to the festive season. Cost of Christmas Past [www.hillarys.co.uk/static/the-cost-of-christmas-past/] allows users to select any year going back to 1968 in order to see just how much Christmas would have cost then.